Detached tile due to lack of movement joints over a parking garage. Balconies, landings and roof decks, which are constructed without slope, often leak over occupiable spaces, thus resulting in the decomposition of surfaces and framing members of the building. The areas without adequate slope cause ponding (standing water) which supports bio-organic growth, shaling and deterioration of stone installations, as well as slippery walking conditions. The use of waterproof membranes can prevent moisture migration through the assembly into the structure. Lack of movement/expansion joints can also contribute to detaching and deterioration of the tile and stone tile assembly. Inadequate bonding can lead to moisture collection in voids and exacerbate moisture expansion of the assembly. Include positive drainage in the finished installation. The finished tile or stone surface and grout must be sloped at least 1/4” per foot to drain, scupper (an opening in the wall of a building through which water can drain from a floor or flat roof) or outfall. All surfaces should drain away from the building structure. The underlying waterproof membrane is sloped toward drain, scupper or outfall. All drains must have weep holes with the waterproof membrane wrapping into the clamping ring of the drain assembly. A secondary overflow drain should be supplied on enclosed decks and balconies to accommodate water when the primary drain gets clogged up with leaves and other materials preventing proper drainage. All moisture absorbed into the mortar bed below the tile and above the waterproof membrane must drain through the weep holes into the drain. The waterproof membrane must be flashed into all perimeter walls, posts, and restricting surfaces. The weep holes should be open and protected. 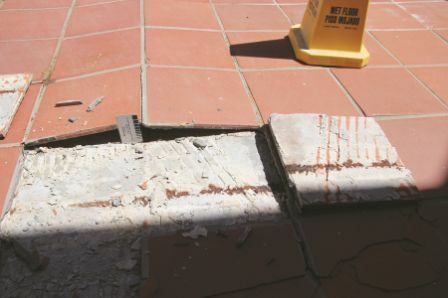 Moisture underneath tile, adjacent to outfall from a deck, must be able to egress from the assembly and not stain or deteriorate adjacent finishes. Proper movement joints (expansion and isolation joints) should be included to prevent moisture expansion and contraction, as well as thermal expansion and contraction, from causing the tile or stone tile to detach from the underlying assembly. Correct expansion/movement joints should be used for all lengths exceeding 12′. Isolation joints are to be used for tile and stone tile abutting all restricting surface including perimeter walls and posts. Tile was detached due to waterproof membrane not meeting ANSI A118.10 requirements. All surfaces slope toward the drain at least 1/4” per foot. Have the expansion joint locations on a 12′ grid apart at the highest mid-point elevation between the drains, with a minimum 1/2” width expansion joint. The same applies to roof decks and balconies. Caulking/sealant at the movement/expansion joint is at a minimum Shore Hardness of “A” (35 or greater) in traffic areas in order to prevent high heel penetration into the movement/expansion joint. 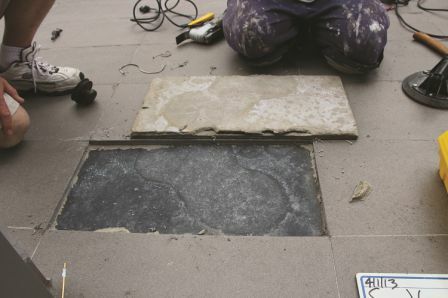 Where tile and stone tile are installed with a wire-reinforced mortar bed over a waterproof membrane, the tile industry does not specify what waterproof membrane is required. Where the tile and stone tile are installed and bonded to the waterproof membrane, the waterproof membrane must comply and meet ANSI A118.10 requirements (American National Standard Specifications for Load Bearing, Bonded Waterproof Membranes for Thin-Set Ceramic Tile and Dimension Stone Installation). Follow manufacturer’s installation instructions explicitly. ANSI A108.13, the International Building Code and International Residential Code through Acceptance Criteria, require any tile or dimensional stone be directly bonded to a waterproof membrane that meets ANSI A118.10 requirements. As the installer, you must verify that the waterproof membrane installed previously for direct bond of tile or stone tile meets ANSI A118.10 requirements. If aggregate is broadcast into the waterproof membrane, then there is a strong possibility the waterproof membrane will not be compatible with thin-set installation. Moisture in adjacent wall assemblies are required to drain to the tile and stone surface, including weep screeds for stucco wall assemblies. A drainage layer allows moisture to have easy egress to the drain, scupper or outfall. All penetrations through the exterior assembly should be properly waterproofed and sealed to prevent moisture from entering the structure below. 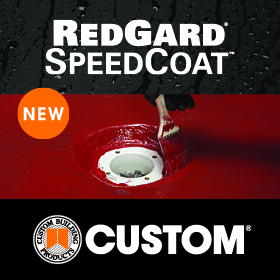 Recommended and warranted for exterior application. Has adequate coefficient of friction (COF) to be used on exterior walking surfaces. Suitable in a freeze/thaw condition in areas exposed to freeze/thaw conditions. Follow the requirements in ANSI A108.1 for installation of mortar beds and tile or stone tile; and ANSI A108.5 for direct bond of tile or stone tile. Average uniform contact areas shall be 95% coverage with the thin-set to tile for exterior tile or stone tile installation. The 95% coverage shall be sufficiently distributed to give full support to the tile or stone tile with particular attention to the support under all corners of the tile or stone tile. Most spot-setting techniques will not comply with 95% coverage. Again, the tile was detached due to waterproof membrane not meeting ANSI A118.10 requirements. 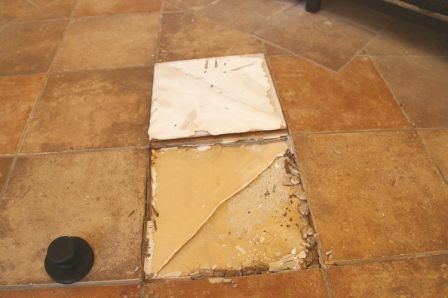 Periodically during installation, pull a freshly set tile up and verify the proper coverage is achieved. Know your setting materials and your favorite adhesive manufacturer. Polymer modified, rapid-setting, light weight are among many of the newer manufactured adhesive available today. Know the installation instructions by the adhesive manufacturer, the cure times and protection requirements for the finish assembly. Also, know your grout and follow the manufacturer’s instructions. Remember to coordinate with movement/expansion joints during installation by including an insert filler or backer rod. Do not let the mortar or thin-set bridge underneath the movement joint between adjacent installations. Reference the current ANSI A108/A118/A136 Material and Installation Standards along with the TCNA Handbook for Ceramic, Glass, and Stone Tile Installation to follow the installation guidelines. Assemblies F103, F103B, F104, and F103 Stone, F103B Stone, and F104 Stone are recommended assemblies for roof decks and balconies in the TCNA Handbook. Other assemblies modified from interior assemblies need to be completed with the same information stated previously in this article. Further, utilize the expertise of an architect, designer, general contractor, and other specialty contractors when any of the above basic standards are not included or properly coordinated before the tile or stone tile installation is started. Document in writing when told to perform any installation not meeting the standard recommendations. Many outside tile or stone tile assemblies are in freeze/thaw areas. Where radiant heating is used in exterior freeze/thaw conditions, utilize the expertise of the adhesive manufacturer, the radiant heating manufacturer, and if available, architect, designer, general contractor (includes builder) and any other specialty contractors. In addition to flashing perimeter walls, tops of parapet walls are required to have either sheet metal flashing or waterproof membranes to protect all horizontal framing. Tops of parapet walls are recommended to be sloped 1″ for positive drainage. 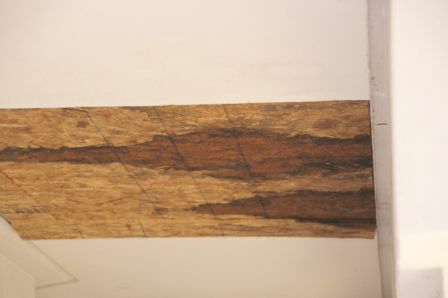 Penetrations in decks, such as handrails, are required to be properly sealed. Fifteen-pound asphalt saturated felt is approved for vertical applications only. It is not approved for usage on the horizontal cap of parapet walls unless covered with an approved waterproof membrane. Unless roofs are sloped to drain over roof edges (outfall), roof drains shall be installed at each low point of the roof. Roof drains shall be sized and discharged in accordance with the Uniform Plumbing Code. Overflow drains shall be connected to drain lines independent from the roof drain lines. Rain gutters from roofs are recommended to be tied into drains to exit the structure. Rainwater egress is not permitted to flow across public walkways. Vertical offset is necessary at door thresholds to properly flash, waterproof, and provide sufficient height to drain all water away from the building structure. Plaza decks are acceptable using pedestal-type systems. 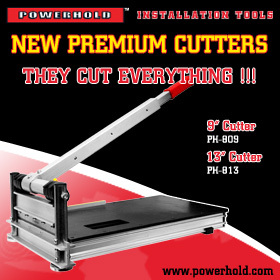 These are designed for severe weather conditions with the same requirements as above. Ceramic tile and stone installed in swimming pools, spas, and fountains require adequate cure time of the setting materials. If a latex Portland cement mortar or latex-based waterproof membrane is used as part of the swimming pool, spa or fountain, the soap and surfactants in the latex that assist in the curing process must also dry out prior to the introduction of water. Water introduced too soon can cause the surfactant to re-liquefy and lose bond to the substrate. 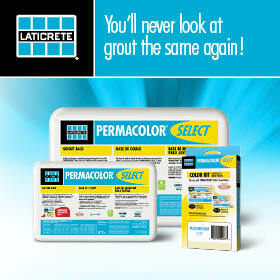 Follow adhesive manufacturer’s requirements for setting materials and curing including grout. Adjacent landscaping should have adequate drainage to accommodate high usage water flow. Lack of drainage can contribute to ground saturation, earth movement and water migration, wicking, percolation and transferring of moisture up through an assembly. Sprinkler spray may aggravate assemblies not installed correctly, especially if there is a lack of movement/expansion joints. Slip, trip and fall hazards should be eliminated wherever possible. Where a single stair can be made into a ramp, use the ramp. Handrails are required at all stairs. The property owners should plan maintenance on a regular basis on all exterior tile and stone tile assemblies. Potted plants should be located near drains as fertilizer may damage many tile, grout and stone tile surfaces. Wood exterior deck with water leaking from above balcony. Lastly, planning ahead lends to successful and long-lasting installations of balconies, courtyards, patios, plaza decks, porches, walking surfaces on roofs, exterior walking surfaces and swimming pool decks. As such, your level of expertise will become elevated and result in additional installations that will undoubtedly assist in a positive profit margin.